Oh, how we hate dieting, but alas that is what we are doing this week. Wish us luck! The four girls were off last Friday. They came to the studio to do a project. Supplies: We bought four large plant saucers, potting soil, and bedding plants with tiny flowers. 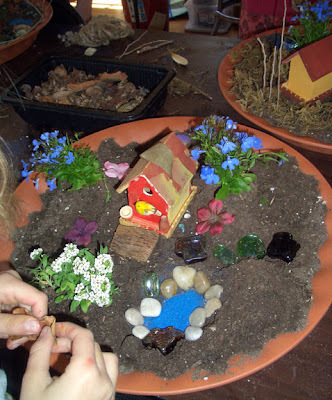 We also bought miniature birdhouses and birds, as well as some wooden shapes. Kerry and I got out lots of our studio supplies for them to use, too. hot glue to make permanent "ponds"
The girls were thoughtful in their planning. 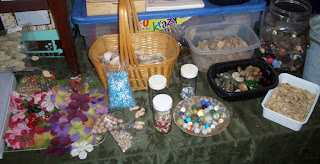 They collected more materials from the yard. 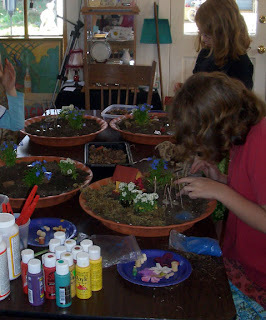 They were very diligent in painting their fairy houses and creating interesting items to attract fairies to their new little homes. The results of the day were fabulous! The girls (ranging in age from 6 to 10) worked steadily for 2 hours. 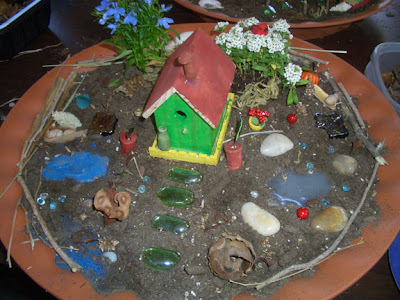 They each came up with original ideas, their own magical vision of what a fairy house should look like with its own sparkly magic. 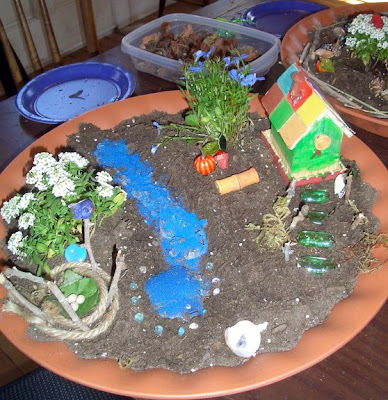 What fairy wouldn't choose one of these lovely homes? 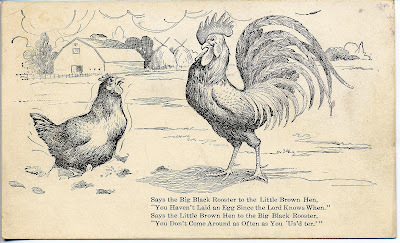 "You Haven't Laid an Egg Since the Lord Knows When." "You Don't Come Around as Often as You 'Us'd ter.' "
I told you we are a witty people. Sometimes a news story just catches my eye. I see the headline and am instantly intrigued/curious/disgusted/shocked. I often don't comment on these stories aloud, I don't want to seem like a trivia addict. The latest one to catch my eye is sadly fascinating: Priest Missing on Balloon Flight. I looked at the headline, and thought, "balloon flight, as in hot air balloon?" Following the link, I discovered that he did not ascend in a hot air balloon, he hooked himself up to a large number of enormous helium party balloons. Isn't that what we all imagined doing in childhood? Didn't we see the Wile E Coyote hook himself up in an attempt to catch the Road Runner? Would anyone actually do that in real life? What would possess a normal adult to hook himself up to a bunch of balloons and expect to fly? It is sad that someone has gone missing. He apparently had dual purpose for his lofty balloon mission, to raise money and to set a record for the most hours flying with balloons. While there was a "flight plan" for his journey, the wind had a different journey in mind. A search is on to find the missing priest. This story is not the first balloon flight story. 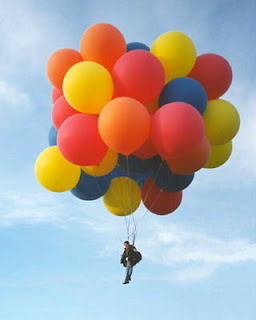 In 1982 there was Lawnchair Larry who rose to 16,000 feet with 42 balloons tied to his lawn chair. Upon further web investigation, there is a Balloon Performance Artist whose project is to balloon from every state. And, I am sure that there are others. Seriously!? Do they really think that this pursuit is a good idea?! But the important message here would be: Don't try this at home! Leave it for the "professionals" or the Looney Tunes. Coffee. Coffee is my weakness. Coffee is important. Especially on a Monday when my kids don't want to get up and neither do I. So I was thinking of my coffee favorites. They fall into several categories. First, coffee at home. I like to drink strongly brewed black coffee from my favorite coffee mug. The mug can make all the difference. 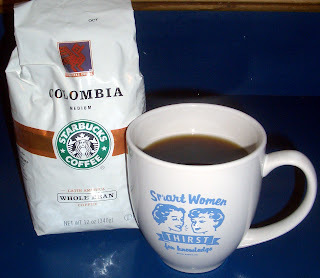 My favorite mug had a retro design with the motto "Smart Women Thirst for Knowledge" They were from Uncommon Goods, several years ago. Check out their cool stuff! My second and third coffee favorites fall under the category of coffee away from home. The most enjoyable is to have coffee with a friend. I enjoy coffee at someone else's home or at a coffee establishment. My favorite local place to have coffee is called Cannon Mine Coffee. It is just a short walk from the studio, which adds to the appeal for me. I love that they always have new art on the walls and something for the community at night, including live music, discussion groups, poker, and tastings (wine, burbon, etc). Plus, Kerry and I make all the lovely candles that grace their tables. My third, and final, coffee favorite is a Grande Skinny Latte from Starbucks. I must confess, it is an indulgence that I partake in much too often. There are creative people lurking everywhere in our lives, we just have to look and ask. I was on a field trip with my daughter's class and noticed another mom with a fabulous necklace on. I went to admire it and found out she had made it herself and has an ETSY site. The piece was a recycled Scrabble piece with brilliant papers on it. 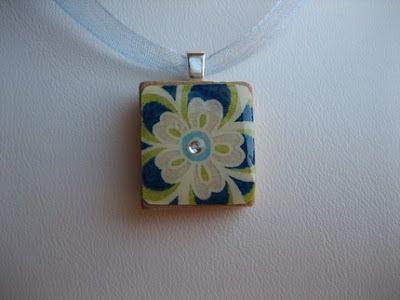 I have seen other pieces made in the same fashion but not with the same high quality artistry or attention to details. Her name is Christiane and is a a stay at home mom with three kids. Check out her ETSY site featuring jewelry and appliqué work. We hope to feature her in our next show at the studio but until then support her and all of the other artists in your lives. "It is not a secret if it is known by three people." This is bad for us bloggers. 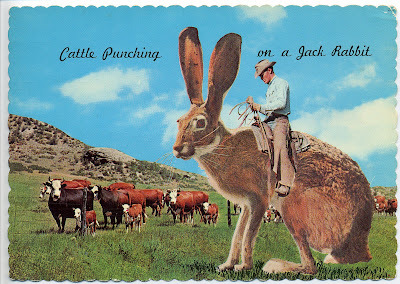 Enjoy your day and check out www.postsecret.com for some tantalizing secrets. An interesting public art/psychology experiment, the sites posts secrets people send in on postcards. There are several books compiling the secrets, as well. New secrets are posted on the site every Sunday. So here I sit in front of the computer with laundry to do, ruffles to sew, dishes to load. I love to cook. Primarily, I think because I love to eat. 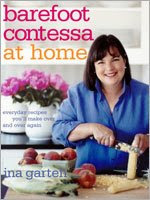 One of my favorite cookbook authors is The Barefoot Contessa. My favorite thing about her recipes is that the are often very simple to make, but because of her use of high quality ingredients, it tastes anything but simple. They taste like luxury foods. Two of my favorite recipes are for her Satay dip and her sun-dried tomato dip. The Satay dip is wonderful with grilled chicken and last for up to a month in the fridge. Cook the olive oil, sesame oil, red onion, garlic, ginger root, and red pepper flakes in a small, heavy-bottomed pot on medium heat until the onion is transparent, 10 to 15 minutes. Whisk in the vinegar, brown sugar, soy sauce, peanut butter, ketchup, sherry, and lime juice; cook for 1 more minute. Check out some of her other recipes and books. 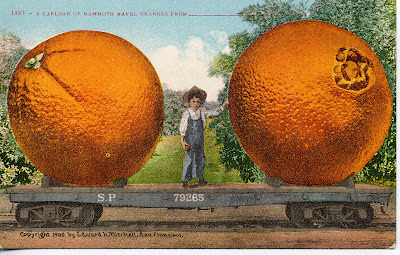 These two Friday freebie images come from a part of the collection of postcards that has super-sized everything from fruits and vegetables to insects and animals. 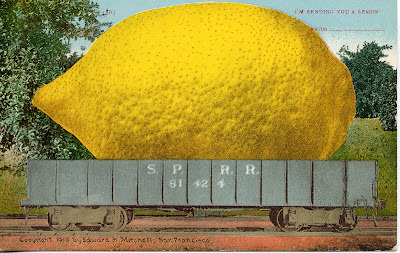 In fact, I have a whole trains worth of jumbo fruits and vegetables. These fun, surreal images were printed in 1909 and 1910. They would make a bright addition to kitchen decor. Sometimes you just find the right thing at the right time. 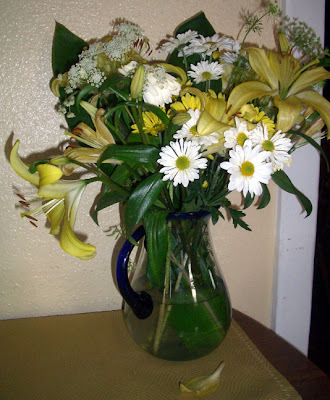 I found these flowers, $5 a bunch at my local grocery store, last week. I couldn't resist and bought two bunches. Usually grocery store flowers have a short life, these have brightened my week. They're looking a little tired now, but not bad for day 7. So, this is how I brought spring indoors. Have a lovely springtime day, where ever you are. p.s. it's snowing here today. can stay in bed until midday"
Here's to taking it easy lately. Enjoy an extra cup of coffee this morning. I am sure you have been there, if not for your kids, you did it for yourself.... scrambling at the last minute to finish that costume, diorama, book report or term project. This time, the story involves me, my two girls and two costumes for school presentations. On Sunday we discovered that the Mermaid tail that my 9-year old wanted to borrow from a friend was no longer available. No problem, I can make one, right? So, off to the Internet to Google "easy mermaid costume." Jackpot! 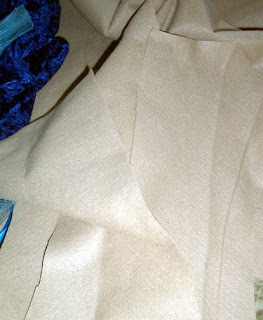 There are lots of links with photos and directions for easy to make costumes. 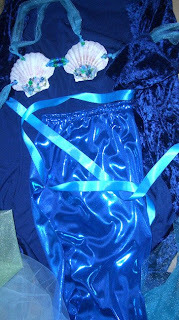 She chose some lovely electric blue lamee material, (think Xanadu) and three watery shades of tulle (think bridesmaids of the 80's). We also had a lovely navy blue, crushed velvet dress to modify for a cover-up. So armed with yards of tulle, blue lamee, satin ribbon, and pinking shears, we set out to work. Thank goodness for pinking shears and for fabrics that don't unravel, we may even make it to our Thursday deadline! Happy with our progress on Monday night, she showed her sister the beginnings of a mermaid costume. And then it happened, my 6 year-old looked at me and said, "Mom, will you make me a camel costume." By Thursday?!? I nearly fell over. Back to the computer. Unfortunately camels are not nearly as popular as mermaids, there aren't many entries when you Google "easy camel costumes." And they are not nearly as glamorous, either. At the fabric store I choose a camel colored felt. Thankfully pinking shears will work here, too. Hmmm, maybe I will throw in a little fabric glue and we might all make it to Thursday with our sanity. We are going to try and let you in on one of our favorite finds each Monday. This week we wanted to let you know about a new discovery in one of our very favorite categories, wine. Martha Stewart, the woman who can do anything, recently launched a line of wines. Rachel couldn't resist and bought a bottle for me. We tried the Cabernet varietal and enjoyed it very much. It was not too strong but with enough bold flavors. I then found the line at my local wine store. Sale price was $9.99, very reasonable for a nice bottle that you can have a with a weeknight supper or a casual dinner with friends. I bought the Merlot and again was quite pleased. It was served at our local book club meeting with a lovely array of appetizers (prepared by Rachel, a very delicious bruschetta and asparagus wrapped in prosciutto.) The Merlot blended well with the foods. They are both wines that I definitely would serve again. There is also a chardonnay that I will try soon. I hope you all have a chance to try some of Martha's wines and enjoy them as much as we have. I love these old photo cards! 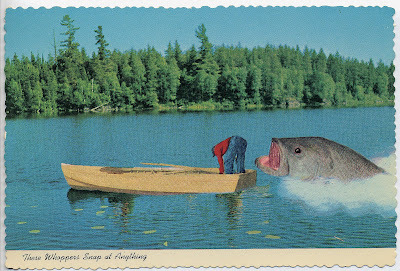 This one comes from a undated, vintage photo postcard. What in the world are these guys doing? 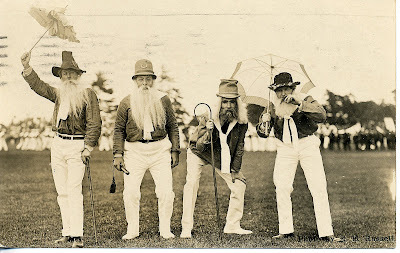 Who are they, the original ZZ Top? 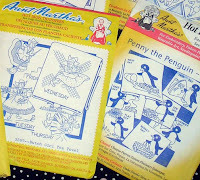 We are pleased to award A Very Mary Design a fabulous package of collage materials, including a kitschy Aunt Martha packet. We can't wait to see her new Aunt Martha tatoo! 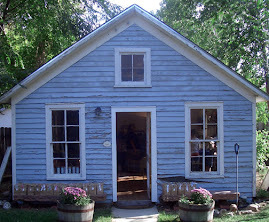 Take a moment to check out her great blog. And, Mary Ann, when you read this, send us your address via email so we can send you your winnings. 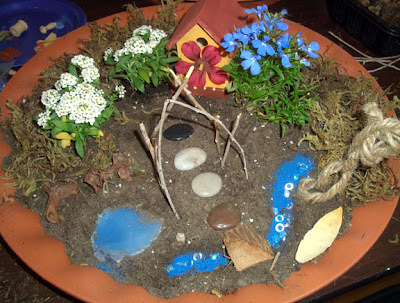 Let us all enjoy our little homes today with wonderful food on the table and beauty and art all around us.